Leicester Tigers flanker Tom Croft has endorsed Leinster's choice of Matt O'Connor as their replacement for the outgoing Joe Schmidt. Schmidt has been unveiled as the new Ireland head coach and O'Connor is the Irish province's first choice as his replacement. 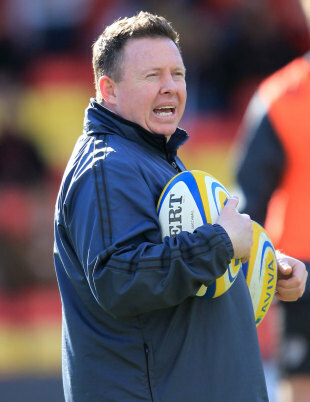 O'Connor has been with the Tigers since 2010 and had helped the team to Premiership finals in 2011 and 2012. "If Matt does go he will go with our best wishes," Croft said. "He is a superb coach in attack and defence, the way he gets the boys right, his personal relationships with players are very good, he is an excellent man manager and players have a lot of respect for him. That decision will be up to him. "He is a world-class coach and I think he has proved that in the way he has shaped Leicester's attack and defence. It's not surprising that other teams are after him. We'll have to see if that happens." Next up for Croft and O'Connor is their final Aviva Premiership match of the season against London Irish and the Tigers will be aiming to recover from their loss to Bath in the last round of matches. A win would guarantee Leicester a home semi-final in the play-offs and from there the aim would be to reach their ninth consecutive Premiership final, though the Tigers squad are not taking a place in the Twickenham final for granted. "If any player ever gets to that point it is quickly drummed out of them by their peers and surrounding players or the coaches," Croft said. "We never expect to get into a final, it has to be earned, that is why, as impressive as it is, out of the last 15 years or whatever Leicester have been in 13 of the finals, it is an impressive stats but it has to be earned and worked for."